Jefferson Vann shares a devotional thought about Jesus’ death. 15 just as the Father knows me, I also know the Father, and I lay down my soul for the sheep. 16 But I have other sheep who are not from this sheep pen; I must lead them also, and they will listen to my voice. Then there will become one flock, one shepherd. 17 This is why the Father loves me, because I lay down my soul so that I may take it up again. In this interesting continuation of the gate/shepherd/sheep parable, Jesus carries the allegory out. There is still a connection with the parable, because three characters still remain: the owner, the proper shepherd, and the sheep. Jesus repeats and augments his statement about laying down his soul. The soul is the life on loan from God. To lay her down (ψυχή is a feminine noun, so all the pronouns are actually “her”) is to die willingly, to take her up again is to be raised to life again. Jesus was not talking about the so-called immortal soul. If it were immortal, he could not lay it down. 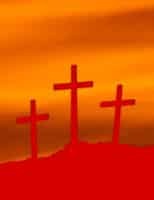 He is talking about his part of divine plan for our salvation – his voluntary death on the cross. Jesus also shows the Father’s part in the plan, in loving the Son, but also in giving him the right (ἐξουσία) to die and be resurrected. Jesus also talks about the other sheep that he must lead (ἄγω). He’s talking about all those who will become part of God’s flock after his resurrection. That is us. Lord, thank you for your love and grace that brought salvation to the rest of us.